I'd be interested to know if hiccup stopping technique works for other parents. Our baby, Asha, gets hiccups a lot. It was really stressful, especially for my wife. Actually, I think it was more of a discomfort for my wife than it was for Asha. So I came up with a process that works to stop those hiccups cold. It's worked for us 100% so far. 1) Wait for the baby to seem agitated by the hiccups. 2) Hold the baby so she is sitting up. 3) Feed the baby 1 oz of pumped breast milk ( or formula ) out of a bottle. The first step is key. I think at first Asha finds the hiccups kind of fun and interesting. It takes a few minutes before she tires of them and gets upset. In the second step we have Asha sit up almost as if she's sitting in a chair at a table. I'm not sure if it is essential to the process but we use Dr. Browns bottles with the gas reducing insert system. Better display of the notes and staff. I decided to try out these new Pharox LED bulbs by Lemnis Lighting. With the government phasing out old style incandescent bulbs by 2014 I figured I'd have a look at the new LED technology that's coming out. off of old incandescent bulbs. One is that the traditional household measurement for how bright a bulb will shine is in watts. A 60 watt bulb is the standard, if you want a little less light you grab a 40 watter out of the garage, a little more go for 75. Breaking this tradition has been difficult. I'd end up saying things like, "this bulb is a 60 watt equivalent for 6 watts." We should instead be measuring light output in lumens. A standard 60 watt incandescent bulb puts out 850 lumens. 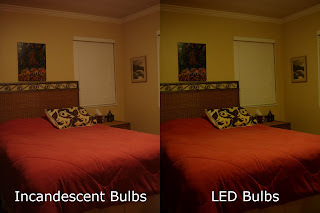 Not knowing light values in lumens can lead us to be tricked by advertising. For instance the Pharox 300 says it can replace up to a 60 watt bulb it only puts out 360 lumens. So, it's not as bright. Even though it's not as bright it is still way more efficient. 360 lumens at 6 watts (60 lumens per watt) is a lot more than the 14 lumens per watt a 60 watt incandescent gets. Another transition issue is the great discrepancy in the colors that different lights put out and the confusing way that the color is measured. Color is measured in temperature and the higher a color's temperature the "cooler" the color. Totally weird and backwards. Not only have color and temperature been confused but "warmer" colors have less temperature. How annoying. 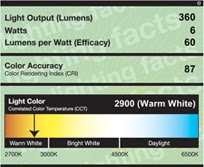 That's why I like these new lighting facts charts they have lots of info and a color bar. They are program of the U.S. Department of Energy. For the most part these bulbs are dimmable, as they claim. It may sound odd, but they dim better then they brighten. Sliding the dimmer down provides a smooth transition to off, but sliding it back up the light stays off to almost all the way up. The cause of this behavior may be the quality of my dimmer. The container states that the bulb may not be compatible with all dimmers. I have heard of dimmers that do not perform properly on low wattage loads. As you can see in the above picture, the LED bulbs are a bit dimmer and the color is a little bit cooler but, these bulbs are adequate. They are dimmable. They contain no lead or mercury. I like them much better than CFLs. So I'm going to keep these, but I think I may try the Pharox 300 Flame next, it has a color temperature of 2200 instead of the 2900 on the standard Pharox 300. How could you invent all this? "I didn't know it was hard." Will Wright and Jill Tarter discuss how video games can be benefitial to education. Will Wright is the video game designer of the Sims and Spore. I believe Jill Tarter is the astronomer on which the movie and book Contact was based.